OFN Members vote on the OFN Board at the OFN Membership Meeting on Thursday, September 28, from 8:45 AM–10:15 AM. Can’t make it to the Conference? Contact Seth Julyan to vote by proxy! CDFI Connect spoke with Carla Mannings, Chief Program Development Officer, Partners for the Common Good, to learn more about the candidate. 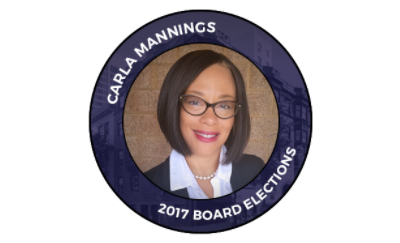 Check out Carla’s candidate video and statement here. Personally, I am the proud mother of two wonderful children. My son, who lives in Atlanta, is a graduate of Syracuse University and majored in Biology. My daughter is a current student at the University of Alabama and has a double major in the fields of Physics and Dance. I enjoy spending time with friends and family, reading, and partaking in outdoor activities and the arts. Professionally, I have enjoyed a 30-year career in banking, the CDFI industry, and community development. My experience includes working in areas of finance and commercial and real estate lending – both within the banking and CDFI industries. I enjoy working with people, and being a part of achieving positive social impact, especially for the economically underserved. CDFIs are important to our society and to me personally. I believe all people have a right to opportunities and fairness that this country has to offer: safe housing, affordable and effective healthcare, education, social justice, and dignity. Our industry works hard to achieve this and it is incredibly energizing and motivating for me. I also have personal experience of family members who have benefited from the services our industry offers. I have one family member who is disabled and depends on social services for her well-being. There are many policies that affect her and other disabled citizens that ultimately keep them in a state of poverty, in some cases without safe or decent housing. This issue must be addressed and corrected, and I am proud to work in an industry that is doing just that. Additionally, my mother enjoyed visiting the neighborhood senior community center where she fellowshipped with new and old friends, took classes, and enjoyed having tasty lunches. This service, which CDFIs provide critical capital to fund, kept her happy and increased her quality of life. Lastly, we also affect policy by telling our stories to those who affect legislation. I am energized by this. As I visit communities, I think about my personal stories and am further inspired by the work that we as CDFIs and partners do throughout the country. It is important for OFN to be a leader in ensuring that CDFIs have access to reliable capital. Because we are a membership organization, we have the opportunity to bring our industry together to serve as one voice united in shaping policies that benefit our industry. There is a lot at stake right now for our industry. Our current and future funding is extremely important. We need to make sure we can secure funding for 2018 and for years to come. We need to make sure we have stable funds from the federal level, and that our programs, such as NMTC and the Bond Guarantee Program, continue to be supported. We must collectively determine how to communicate who we are to our industry partners most effectively. As I attend meetings with potential CDFI partners, like the investor community, the consistent message I hear is that others have difficulty understanding our industry. They find it challenging to understand how to align with our objectives. This communication obstacle impedes CDFIs’ access to vital capital. The CDFI industry is varied geographically, in business model, and in the products we provide, but there is a brand and messaging components that we can create to help others understand us for the purpose of funding and partnerships. I bring a holistic viewpoint and perspective. I have worked and have expertise in banking and community development, both nationally and locally. I have developed a breadth of partnerships and relationships across the industry that I would like to connect for the advancement of the CDFI industry as a whole. I hope to join the OFN Board and use the resources I have to connect our efforts holistically to achieve industry-wide objectives around funding, policy, and messaging. By working hard and smart, I would like to make this industry stronger than ever by 2020. To ensure an efficient voting process, please identify your CDFI’s Voting Delegate in advance of the September 28 Membership Meeting and contact Emily Tunney with the delegate’s name. Voting Delegates will be able to pick up their ballots 30 minutes before the start of the Membership Meeting.